It's a little chair for your closet. Just the right size to sit on and put your shoes on. Complete your dressing set with this elegant vanity chair by Safavieh. 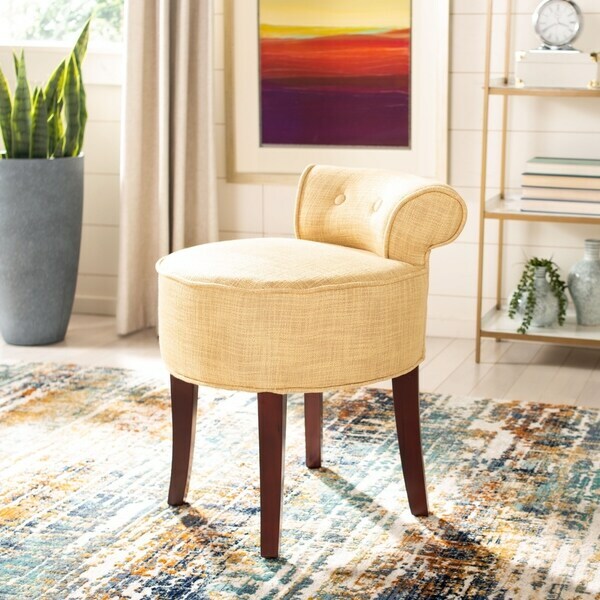 The perfect height to pair with a standard vanity, low desk or makeup table, this chair is upholstered in elegant gold viscose blend fabric to add an extra dash of class. The elegantly turned wood legs are finished in a warm brown stain to add warmth to the chair's overall appearance. Underlying the attractive exterior, this chair has a sturdy hardwood frame, which withstands regular use. The tufted curved back is ideal for unobtrusive support while you sit and prepare for a big event. Dimensions 23 in. H. x 18 in. W. x 19 in D.
This vanity chair is good in workmanship, style, and color, but the chair is SHORT!! The description says the seat is 19.5 inches in height, but only if somehow the laws of mathematics changed and 17 inches is now 19.5 inches. That's right, it is a full 2.5 inches shorter than they say it is. If a shorter vanity chair is your desire, I say go for it; otherwise, be warned. I bought a small desk from target and searched far and wide for the perfect vanity stool. I already have some other home items from this brand, and they are all of great quality. This arrived quickly, and the color was slightly more yellow than i expected, but still a beautiful "gold" shade. The fabric is elegant and high quality. I don't understand why people think this is too short. It's perfectly petite. It fits perfectly under my desk, and when i sit down, i can see myself in the mirror and reach everything comfortably. Great little vanity chair. The quality of the chair is on the higher end. It came fully assembled with the legs wrapped in bubble plastic for protection. The chair was covered in a dust wrap which I chose to leave on the chair since I have an animal. I love this little chair. Its comfy for sitting to do hair & makeup. Its cushion is firm and will probably fit with almost any decor. I am using this chair in my walk in closet. It is the perfect size and height for a closet. The style can be whatever you want..traditional or modern. The color is a soft yellow. It came put together. If you have a small space this is a sweet chair. If you are looking for a Vanity height stool it worked perfect for me - I'm 5'10 . It is a small chair but its perfect for my vanity . It is more yellow than gold metallic color . So more of a yellow gold . Perfect little chair for my make up vanity. The gold color is a beautiful color and not awful garish gold. Very soft for sitting. It's held up well as I've had it over 4 years! Great little chair. I’ve been using it for a few months and still looks brand new. The color is a butter yellow (tweed like) with two tufted buttons. Comfy yet firmn I find it to be comfortable and the perfect height for my vanity area. I can’t see you going wrong with this purchase. Safavieh Rochelle Gold Vanity Chair. shipped within the time frame issued. Nice quality for the price. Arrived from the carrier with no issues. Thank you. I got this chair for a little corner table for our cozy guest bedroom. It is for a desk and or vanity use. It is the right size and proportion for the table. It is quite lovely and the color is a nice tone of gold. This was a great vanity stool. The quality was very high. Unfortunately I had to return this chair because it was too short for my counter height vanity area. Definitely would have kept it if it had been taller. This chair was way too short. One of the other reviews said the same thing. I may try to change the legs on the chair because I do like the style of the chair. Cute little vanity chair. It fits perfectly with my antique vanity and looks fabulous. It is also comfortable and will tuck away easily. I am using this vanity chair at the foot of a twin bed to maximize space and have a place to perch for putting on shoes, etc. Works perfectly! beautifully made was looking for a well made chair for my vanity found it! It is the perfect fit for my vanity table. Bought this vanity chair for my daughter's room. It is the perfect height for her to use at her table. The table arrived quickly and well packaged. It is golder than the internet picture, but goes in her room quite well. Great chair. Just a little light in weight. Amazing little piece. Look for it. A popular site had for much more the color is great. Fabric high end. Would buy again. Perfect for bathroom counter. NEED A LITTLE CHAIR TO GO INSIDE MY CLOSET. THIS WAS RIGHT SIZE AND COLOR AND RIGHT PRICE. "Is assembly required for this item?" No, it ships fully assembled.